I would like to thank MindSync for giving me the Liebster Award. I am not sure of the history of this award, as feel it is named after someone, so if anyone knows can you please let me know via a comment. It is always an honour to receive these awards, as there are so many great well written blogs. I feel very much like the beginner at this! Thank you so much for choosing me. That said I have fulfilled the first two parts for excepting this nomination. I have thanked MindSync for nominating me and displayed the award. The next rules for receiving this award I am going to break!! Those who know me well would know if there is a rule I like to bend or break it! Instead of nominating 11 blogs I am just going to name one, at the end of my posts there is a list of blogs I follow and they are all worthy, so I am not going to choose. I would like to nominate a fellow Australian for the work she does in Massage and her interesting posts on how massage can be used to heal. Lisa shows how we can all benefit from massage and even if she lives a long way from your home I suggest that you find someone near you who does similar work… It can only help your health.. Thank you Lisa.. You will have to check out MindSync for the rest of the rules of this nomination! When things don’t go right! Cellulitis has been the bane of my life, for the last 11 years, at a time when I had hoped to be rid of it for ever it has reared it’s ugly head and maybe ruined the party! In saying that I am not really expressing the depths of my anguish or the fact that I find it very difficult to write this post. On Friday I had an appointment with my doctor for a six week check up after my surgery. During the week I had been concerned that the knee was not reducing from the post surgical swelling and that the transferred nodes at the side of the knee were raised and firm to touch. The doctor was equally concerned and felt that there may still be some infection present and once again prescribed more antibiotics for the next month. This in itself would not appear to be a problem, but what I did not know is the infection can damage the transferred Lymph Nodes, causing theme to “die.” What a shock, this was a side effect I had not heard of prior to surgery, nor can I find anything written on this subject. The reality is that all I have been through over the last few weeks may all be for nothing. I find it very difficult to deal with this and though it is not definite yet I am very fearful that it will be so. I am to have an ultrasound at the end of May and see the doctor again on the 7th June, I will then know if there are any viable Lymph nodes present in the transplanted tissue. In starting to write this blog I promised to document my journey with Lymphoedema and “My lymph Node Transplant.” I wanted it to be a personal account rather than a medical one and to share others progress along the way. I wanted to bring together the community of Lymphies and bring some hope for the future, if not now then a few years time, every new surgery has to start somewhere. Think about when we heard of the first heart transplant, now they are common place. What ever the outcome for me I have no regrets in making the decision to go ahead with surgery, if I had not I would have always wondered if it would help. I really love writing this blog, it helps me and I will continue as the story is never over! Liposuction helped shrink my agonising swollen leg: How lipo is relieving a chronic lymph problem affecting thousands. ‘My leg was so big, it was hard to bend it,’ said Roisin Gallen By the time Roisin Gallen received treatment for chronic lymphoedema, her left leg was twice its normal size. The divorced mother of two, normally a size 12, had to wear size 18 trousers nipped in at the waist. ‘It was like having elephantiasis,’ says the 45-year-old who lives near Belfast. ‘My life was terribly restricted. ‘My leg was so big, it was hard to bend it. ‘It was like walking with a large, inflatable pillow strapped round it.’ Roisin’s lymphoedema was set in train by treatment for cervical cancer in 2001. This included having a hysterectomy, where lymph nodes in her groin were removed to stem the spread of disease, followed by radiotherapy. Up to 250,000 people in the UK suffer from lymphoedema and key triggers for the devastating and often disfiguring condition are surgery and radiotherapy where lymph nodes are removed or damaged, particularly in breast, prostate and gynaecological cancers. Lymphoedema is a swelling in a limb as a result of damage to the lymphatic system, the body’s waste disposal system. 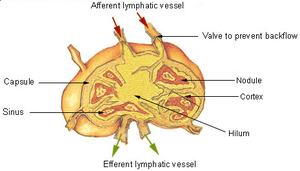 The lymphatic system plays an important role in the immune system, removing bacteria and waste from the tissues through a fine network of vessels carrying a fluid known as lymph. This travels to the lymph nodes, where it is cleansed. If the system is compromised — as can happen as a result of both cancer surgery (where the nodes are removed) or radiotherapy (which can create scar tissue that blocks the lymphatic channels) — unfiltered lymph fluid becomes trapped and forms pools, causing swelling. This can begin anywhere from a day to 30 years after surgery — it’s not clear what sets off a delayed response. Until now, the underlying causes of lymphoedema have been regarded as irreversible. But now two remarkable pioneering surgical techniques that put a potential cure within sight have just started to become available in Britain. 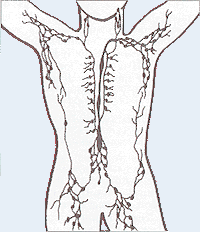 In a healthy person, the lymphatic fluid drains into blood vessels after being filtered by the lymph nodes. New imaging techniques are revolutionising lymph bypass surgery. This involves pinpointing healthy lymphatic channels and re-routing them by stitching them into the blood vessels, bypassing blocked lymphatics. But with some lymph vessels no more than 0.2mm wide, this is technically challenging microsurgery, explains Kelvin Ramsay, a plastic and reconstructive surgeon at the Royal Marsden Hospital, London. First, dye is injected into the patient’s hand and it’s then taken up into the lymphatic system. Surgeons turn out the lights and use a near-infrared camera, which lights up the microscopic lymphatic channels. This shows clearly which channels are blocked so that only clear channels are grafted on to blood vessels. There’s also lymph node ‘transfers’. These aim to kick-start the lymphatic system by harvesting lymph nodes with their own blood supply from elsewhere in the patient’s body and plugging them into the armpits of breast cancer patients who have lymph nodes cleared or damaged by their cancer treatment. As soon as the transferred lymph nodes are connected in the armpit, they start releasing substances that encourage the growth of new lymphatic vessels as well as the old pathway to open, says Anne Dancey, a plastic and reconstructive surgeon at the Queen Elizabeth Hospital in Birmingham who has already performed 25 lymph node transfers. The hospital is now starting a clinical trial comparing lymph node transfer to standard treatment with specialist massage and compression garments. As with the lymph bypass, before the transfer, dye is used to flag up the blockages. ‘My patients have been able to get rid of their compression garment and that is life-changing for them,’ says Ms Dancey. Another great write up by Angela Brooks for the Daily Mail ….. Thank you for bringing awareness to the needs of those with Lymphoedema. Liposuction for Lymphoedema is available in Australia, England, Sweden and USA plus other countries, but remember you must always wear compression garments after surgery. How is Sue going in the USA? I thought you may like the latest update from Sue in the USA.. I have copied from the email she has sent so the words are her own… Thanks Sue glad you are progressing well. Well the drains were taken out on Friday — one two three, breath in, blow out and bam-o they are out! The feeling of freedom is beyond description! My pain level is really like a one on a ten scale. I get some tinges of pain in the incision sites. I have about a five inch incision on my left side, under my arm pit, a few inches below that, and one on my left upper thigh. There is no flap visible. The skin is glued together on the thigh and I have steri-strips, no cloth stitches, on the left side incision. The left leg is the affected one. As I think you know, I developed lymphedema almost one year to the day following my total radical hysterectomy as a result of uterine cancer. My surgeon had not warned me of this condition, and I knew of no precautions to take to avoid it. I believe I bumped my leg getting into the shower one morning, and that is when shortly thereafter I noticed a slight swelling in my left leg. I was able to manage it well with initial bandaging, manual lymphedema drainage therapy and the daily use of the compression pump. However, a bout of cellulitis (my only one) in August of 2012 did a number on it and my leg swelling never returned to its pre-cellulitis condition. I am now feeling some tingling in my leg, which I don’t know is just the nerves waking up or maybe some action happening with the transferred lymph nodes. I had two difficulties to bring to your attention. First, when I tried to put on my compression hose (I was just measured the day before the surgery so I know I have the correct size — extra large), I found that they caused immediate swelling and collection of fluid so I threw those off as soon as I could pull them up. Oh what a joy that is. Then I tried to use my compression pump and really felt it caused more swelling. I find that doing nothing but elevating the leg and moisturizing it is the best thing for me. Do you use a pump? I know you are using your compression hose but did not remember any info on your blog about the pump. Some doctors are against them. 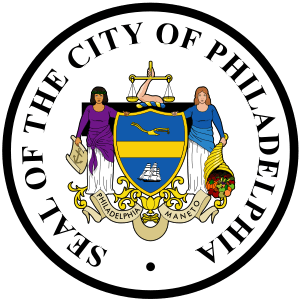 I have to tell you my surgeon, Dr. Kanchwala at the University of Pennsylvania Hospital in Philadelphia, Pennsylvania, is not real knowledgeable about lymphedema. On the day of surgery before they took me into the operating room, I asked him about the compression hose and pump usage. He said, oh we can put you in your compression hose right after surgery and you can start the pump on Monday (two days post surgery). Well I guess he forgot that it would be a little hard to get those darn thigh highs up over the drain sticking out of my thigh and to wrap the compression sleeve around the drain. I see him on Thursday, 4/25, and I will have to give him a little education. Being a surgeon, he is not that up on lymphedema, he just knows how to transfer the nodes! I had some depression following my use of the pump. Only because I was scared that I did something to mess up the surgery. But it appears everything is okay. I have a nurse who comes in – last week every day and this week just three times and I will be done with her — and she is measuring my leg. Last Monday, my knee area was 17 inches and now one week later, it is 15-3/4 inches in circumference. The ankle swelling is a lot slower, going from 11 to 10-3/4 inches in a week. But Helen, I will take any reduction in size. This morning I woke up and heard a little reminder in my head — Be patient. This is not going to happen overnight. So I am learning to be more patient with results. Now that the drains are out, I have only a bandaid on both sites. I have thankfully not experienced any infections at either site. I am taking an anti-biotic twice a day. Before I had my surgery, I asked Dr. Kanchwala about the possibility of acquiring lymphedema at the site of the node removal. He said it would not happen; that I may have swelling for about six months. So far no swelling. In six months, if this surgery is successful, he will consider liposuction to remove all of the accumulated fat and protein in the leg. I hope this can happen but right now don’t want to get my hopes up too high. I will report on my doctor’s visit. I am hoping he will order manual lymphedema drainage therapy for me. That should also help. I also may wrap my leg with bandages to see if that will help between now and hopefully getting therapy. Thanks Sue and we await your next update after your doctors visit. It is fantastic to be given the Inspirational Blogger award by “Knitting Rays of Hope.” Having not been blogging for very long, I am happy to know that I am reaching out to others and building awareness and education of Lymphoedema, for all fellow Lymphies! As the recipient of this award, the rules are I should pass it on to 15 others, but being new to this I have decided to pass it on to one blog that has inspired me. The courage and openness that is expressed in this blog is truly inspirational and the help it will give others in making this decision can only be of benefit.. Congratulations.. There is a list of blogs that I follow at the end of each post and all are worthy of this award, but I could not decided on who to leave out, so I chose one only!!! The other part of this award is to say seven things about myself that others may not know! I have two great kids who are adults not kids any more! This post is very important to any American who has Lymphedema or who has lymph nodes removed, so could potentially have Lymphedema, it is for those with Primary or Secondary Lymphedema. You need to get behind Heather and help her to change the laws regarding the financial help needed to treat and live with Lymphedema in America. Anyone with, or at risk for, lymphedema should know about the Lymphedema Diagnosis and Treatment Cost Saving Act. This federal bill aims to improve insurance coverage for the compression items (garments, bandages, etc.) used daily in the management of this disease. Complete information about this legislation is available at www.LymphedemaTreatmentAct.org. I know first hand the frustration of insurers’ failure to cover this medically necessary treatment, and the devastating effects this lack of coverage can have on lymphedema patients. My six-year-old son Dylan was born with primary lymphedema. When he was just a baby, and our insurance company refused to cover his treatment, I vowed to fix this. I hope you will join me and the other wonderful patient advocates who are working hard to get this bill passed. Please visit our website and use the submission form (located under the “How You Can Help” menu) to send letters to your members of Congress, urging them to support this bill. It takes less than five minutes to fill in your name, address and add a few personal sentences to the template letter provided. After doing so, please encourage your friends, family members, colleagues and others to do the same. Please feel free to contact me directly with questions. This is an entirely grassroots and patient driven effort, so we really need your involvement and support! Stepping back to move forwards! Today I visited the Physiotherapist for measuring prior to seeing the Doctor on Friday and to judge my progress over the last 10 days. Today a decision needed to be made as to whether the compression stockings were enough to reduce the post surgery knee swelling, or did I need to use compression bandaging. Today going through my mind was the saying, “You can’t make an omelet without breaking the eggs!” or as the saying says above, you need a little rain to make a rainbow! Taking all these thoughts on board I decided to reach for the positives out of today and not dwell on the fact that the swelling in my knee had not improved. When I say I am stepping back to move forward this is taking into account the effects of surgery and infection. The L-dex reading today was an improvement on ten days ago, from 34 to 24.8 and my measurements for lower leg and upper thigh were at pre surgery levels, but my knee, lower thigh and upper calf are another story, there had been no improvement in these measurements. Ten days ago my left leg was 23% larger than my right leg, this has now dropped to 22.6%, I need to check on what this % was pre surgery for comparison. Prior to my Lymph node transplant I knew that results would not be seen for up to a year, even two years down the track improvements can still happen, maybe by six months the lymphoscintigraph can show improvement. What I had not thought about was what happens in between? How do you work with post surgery swelling and Lymphoedema all at the same time? I guess that over the next few weeks I will find this out!!! The positives from today were to find out about two new products that I had not come across. The first was some gloves made by Venosan to use in putting on compression garments. I have always used rubber gloves but I forgot to take mine today and had to go to the chemist shop in the hospital to see if they had any. No rubber gloves but some very neat stretch material gloves with little rubber bits to grip the compression garments. They worked really well easier than rubber gloves, so I treated myself to a pair!! The second new product was called Ready Wraps, these can be used instead of compression bandages and are much easier to use yourself. I am told they are not so bulky and allow more movement. They are quick and easy to use at any time and are available for arms and legs…This is a link to a video.. When I see the doctor on Friday he will decide what level of compression can be placed over the transplanted nodes to reduce the swelling in the knee. In the mean time I will continue my MLD and gentle exercise and although it feels as if I have slipped backwards at the moment, I will remember it is for a reason and to focus on the bigger picture, ahead when the rainbow comes out after the storm. One of the reasons that I started this blog was due to the lack of information I could find from patients who had Lymph Node Transplants/ Transfers to the leg. There also seemed to be a lack of post surgical info, what I found seemed to read as if the patient had the surgery, the limb was all good straight away and they went home!!! (All references seemed to be for arms only too). I first thought to keep a diary of my progress, I then thought about a blog so others could share my journey, in the hope it would help another patient having this surgery or thinking about having it. Sue, as I did, first say the Lymph node transplant surgery on the television, a lady had lymph nodes removed from the groin and placed in the arm pit to relieve the Lymphoedema after breast cancer surgery. The program said she was progressing well and the surgery had been performed at the University of Pennsylvania Hospital. Sue contacted the hospital and made an appointment to see the micro surgeon who had performed the operation. After seeing the surgeon her operation was arranged for 12th April, she was to have lymph nodes removed form below the arm pit in the thorax and placed into her groin. “A Vascularized Lymph Node Tranfer (VLNTx) is microsurgical procedure where normal lymph nodes and their associated adipose tissue is transferred to a region of the body that suffers from lymphedema as a means to i.) decrease limb size; ii.) alleviate subjective symptoms of “heaviness”, “achiness” and early fatigue; iii.) potentially reduce daily compression requirements; and iv.) slow progression of the disease. VLNTx were initially introduced in Paris by Dr. Corinne Becker and her associated group of surgeons in 1991. Since that time, Dr. Becker reportedly has performed more than 1500 of these transfers in France, Brazil, Korea and Egypt based on the premise of lymphangiogensis; namely, “like reconstructs like”. This “French School” of lymph node transfer suggests that normal lymph nodes and perinodal fat containing essential stem cells, adipocytes, and macrophages transplanted on their native blood supply, effect a normal repair process in the direct region of prior injury (i.e. the axilla after axillary lymph node dissection and/or irradiation). Key aspects of this approach include thoughtful patient selection, a no-touch, atraumatic harvesting technique, aggressive adhesionolysis in the area of injury and meticulous microsurgical skill securing effective revascularization of the transferred flap. Dr. Becker and her associates have published limited numbers of reports outlining this technique with a focus on the upper extremity, primarily at the level of the axilla and fewer reports at the antecubital fossa.” (Ann Surg 243: 313, 2006; Breast 17: 472, 2008). Sue and I, since her initial contact, have remained in touch so we are able to share our experience and progress. This has been a help to both of us as we understand why we would have such new surgery…..to be the pioneers of the leg surgery!! For Sue living in the USA there was to be a huge shock, a few days before her surgery she had a phone call from the surgeons office, her private health fund had refused to pay for the operation and she needed to pay $10,000 up front for the surgery to go ahead. In the USA the Lymph node transfer surgery is seen as “investigational” and not covered by health funds. Those of you in the USA who have Lymphoedema or the potential to have Lymphoedema should take a look at this website in the hope of making changes re the health coverage for Lymphoedema care. Please click on the link below it will take you to the Lymphedema treatment Act website for more information…. <>Welcome to the Lymphedema Treatment Act website. The Lymphedema Diagnosis and Treatment Cost Saving Act will improve coverage for the diagnosis and treatment of lymphedema from any cause. Untreated lymphedema is progressive and leads to infection, disfigurement, disability and in some cases even death. Thus, prognosis for the patient is far worse and treatment more costly when the disease is not identified and treated in the earlier stages. Contact your members of Congress using our simple submission form. PLEASE NOTE THAT BILLS DO NOT CARRY OVER FROM ONE CONGRESS TO THE NEXT. THE LYMPHEDEMA TREATMENT ACT IS CURRENTLY BEING PREPARED FOR REINTRODUCTION IN THE 113th CONGRESS. THE LINK IN THE “Current Status” BOX TO YOUR LEFT WILL TAKE YOU TO THE BILL FROM THE 112th CONGRESS. THE LINK WILL BE UPDATED AS SOON AS THE BILL IS REINTRODUCED. Reduction in total healthcare costs through avoidance of periodic infections, pain and disabilities resulting from this medical condition. Sue made the decision to go ahead and pay for her surgery, she felt she had come this far and could now not turn back. Five days after her surgery I had the much awaited email to hear how she was going. Sue was back at home after a two day stay in hospital. She has a community nurse coming everyday to change the dressings and to check her drains. She has an incision on her left side about three inches down from the arm pit, this is where the nodes were harvested, the transfer site is in the top of her thigh on the left leg, rather than the groin. She has a drain in each of these sites and hopefully by now these have been removed, Sue says she has minimal pain. She has been told no baths, swimming or gym etc for 6to 8 weeks, walking is very slow but she feels ok and unlike me she has no infection which is great. I intend sharing updates from Sue along with my own as every surgery is different with different progress and outcomes. If anyone has any questions please use the comments to make contact and I will answer as best I can. Thank you so much “Sue” for allowing me to share your story as well. If you are wondering about the spelling of Lymphoedema / Lymphedema the first is our spelling in Australia and the second is the American spelling… Both are acceptable!!! Lymph node Transfers and Transplants are the same surgery. Be Positive, Patient and Persistent.. I saw this today when I was on the internet and thought how appropriate it was for my time at the moment, I think also a good thought for others to use too. “Be Positive, Patient and Persistent .” Apologies to the original author but there was nothing to say who created this, but such good words, so thank you who ever you are! I thought I would give you an update as to my progress the last couple of days. Yesterday I went to work for the day, which was a big event, given that I had a 45 minute drive each way and realised that the seat belt goes right over the incision on my collar-bone. My previous short drives had been ok but I found I had to put a bit of padding in the form of a wool scarf to protect my shoulder. I have been asked by others if this surgery had been painful, in fact during the whole process there has been very little pain, due to the areas being quite numb and the surgery especially to the knee not in deep. The shoulder and neck however have had some discomfort of late as I think some of the nerves are waking up! Especially as it is my right arm, which I use more, there is quite an ache by the end of the day. However given the length of surgery and the two areas affected I have only needed to use the odd Panadol other than the first couple of days. Back to my day at work which I really enjoyed, I work as a counsellor/therapist so I am sitting most of the time. My doctor had asked if I could elevate my leg while I was working but I thought this would look a bit silly while I was with clients, so in between I elevated! At least the doctor at last let me go back to work! It was good to get out and do something “normal” and to use my brain! I only intend working part-time, as I work for myself I have given myself permission to do this!! Today I went to a large shopping centre near me and felt quite overwhelmed by all the people. It does not take long when you have been isolated for a few weeks to get unused to crowds. I was a bit worried someone would knock or push me or I might trip over, have to pick my feet up!! The main thing is that you can see I am at last doing some everyday things, I maybe slow, I may get tired but I am doing them. I must always remember when there are times I feel down that with Patience, Persistence and a Positive attitude I will get there! One of the things I love to do is photographing flowers, so over my next blogs I will share some with you. I think of flowers as natures Happy Face! Self Compression Bandaging for the arm.. The above picture shows my complex bandaging “kit” and the links to the above videos show how the bandaging is done. Please click on the links to view. Prior to the bandaging a Manual Lymph Drainage is completed to give the limb the best chance of reducing. This procedure can be completed by a qualified Lymphatic therapist, it can be taught to family and friends and can be self administered where possible. There are many other videos on You tube that teach you how. This is especially helpful if local resources are unavailable or there is a lack of health cover for treatment. When I was first diagnosed with Lymphoedema, after much searching, I found a Lymphoedema unit at the Mt Wilga rehabilitation hospital in Hornsby NSW. I spent five weeks driving backwards and forwards everyday, an hour each way, while treatment was done to reduce my Lymphoedema prior to a compression garment being fitted. When I arrived each day at the hospital the bandages were removed and I would have a shower. The therapist then performed MLD prior to replacing all the layers of bandages. I used to feel as if I had a plaster cast on but as the day progressed there would be a little movement possible. On the weekends I bandaged myself, otherwise the bandages were on 24/7 for five weeks. At the end of this time I was measured for a compression garment as it was felt that the leg had reduced as much as possible. I have to say I was very lucky at that time to live in Sydney and to have the help available, also that we had always paid a private health fund as Medicare did not cover this treatment. It is now possible to get five sessions a year covered by Medicare with a special referral from your GP. The importance of the bandaging is to reduce the limb as much as possible, it can be used on a regular basis or when the Lymphoedema flares up due to infection or hot weather etc. I will bandage myself if I am having a problem but I did return to Mt Wilga for a week in 2009 when I had a bad fungal infection that affected the skin. When you have Lymphoedema you are so vulnerable to infections, so it is important to look after the integrity of the skin and the condition if the limb. The bandaging works by putting pressure on the muscles which creates a stronger pumping of the lymphatics, it also pushes the lymph into the deeper lymphatic vessels rather than those nearer the surface. 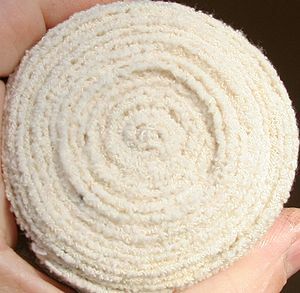 The bandages are tighter at the bottom than the top therefore pushing the lymph up the limb towards the torso. Having them on 24/7 ensures this process continues day and night and does not swell again during treatment.